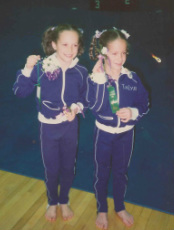 Becca and Talya, 1987 State Meet. Click the pic to hear our Radio ad. One of the greatest things we can give a young child is self-confidence. Gymnastics builds confidence through small challenges in each class. Activities that may seem daunting at first (like walking on a balance beam) are broken into small manageable progressions, providing each child with opportunities to achieve success. Teaching children to listen is unbelievably important. With constantly changing lesson plans, exercises and activities, gymnastics class requires children to practice following directions. Basic concepts like body shapes (tuck, straddle, pike) and landing positions (safety stop) are the consistent themes that bind all of the lessons together. Teachers begin each lesson with a verbal explanation AND physical demonstration of the activity so that children with different learning styles can process the information and follow the instructions. Positive feedback from the instructors reinforces the entire process of ‘listen, watch and participate’. When children are engaging in gymnastics, they are exercising their brains as well as their bodies. New research suggests a strong correlation between physically fit children and academic achievement. Every time you send your child to gymnastics class, he/she is engaging in physical exercise that encourages healthy brain function. Nerve cells multiply and connections in the brain are strengthened. It is not surprising that children who are engaged in consistent physical activity, such as gymnastics, are more likely to get better grades than their inactive peers. All children need to have activities in their lives where discipline and self-control are important. Learning what is allowed and what is not acceptable is part of every gymnastics class. Not only is self-discipline an important part of learning, it is also vital in keeping children safe. Concepts like “look both ways before you cross the street” are practiced and reinforced in a gymnastics class. Gymnastics helps to enhance the development of gross motor skills and coordination. By learning to jump, roll, swing, climb, balance and tumble in a safe environment, we reduce the risk of injuries in the “real world”. For example, a child who learns a “safety stop” at gymnastics will use the same technique when jumping off equipment on the playground. There is no better activity for overall fitness, strength and flexibility than gymnastics. Gaining muscle strength through tumbling, jumping, static flexing, and holding one’s own body weight in various positions help children develop strong and powerful bodies. Flexibility is, simply put, the ability to move muscles through their full range of motion. Flexibility is important in everyday life; it reduces tension, helps coordination, develops body awareness and promotes circulation. Every gymnastics class includes strength and flexibility exercises. Does Gymnastics Enhance Reading? Yes!